Fronted by lead singer, songwriter, guitarist and piano player Dr. Robert (born Bruce Robert Howard, 2 May 1961, Haddington, East Lothian, Scotland), the Blow Monkeys formed in 1981. The other members were Mick Anker, Neville Henry and Tony Kiley. They released their debut album 'Limping for a generation' in 1984. It was 1986's 'Animal magic', their second album, that carried their first hit, 'Digging your scene'. The lyric of the song dealt with the AIDS-fuelled backlash against gays. Robert commented: 'There was a little bit of hysteria about AIDS, I think, in the early days here in the tabloids. People were using it in order to slag off the gay scene and the gay culture. And what I wanted to do was redress the balance in my own way.' 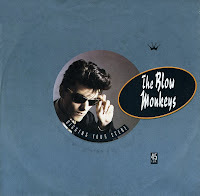 The single reached number 12 in the UK singles chart and number 37 in the Dutch Top 40.